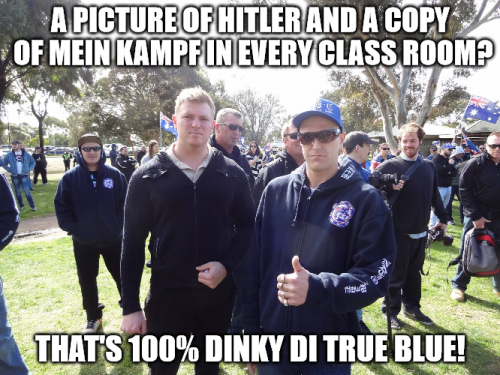 For those of you coming in late, on Sunday in Cheltenham the ‘True Blue Crew’ (TBC) — a racist street-gang based in Melton and Bendigo — organised a meeting in order to discuss the establishment of a vigilante group, one tasked with tackling #AfricanGangs. 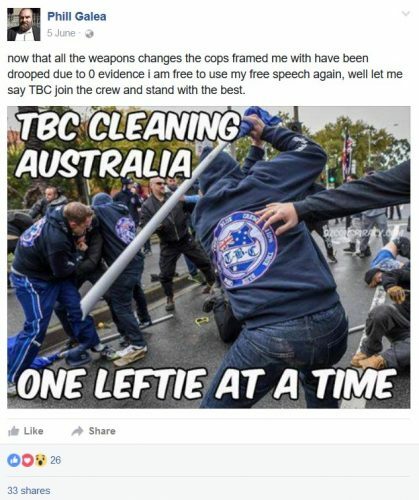 According to reports, the meeting attracted several dozen people: members of the TBC, the ‘United Patriots Front’ (UPF), and several members of other tiny, radical right-wing satellites. Announced some weeks ago, the TBC declared that the meeting would be held at a secret location, the details of which would be released on late Sunday morning to those who’d expressed an interest in attending and passed their stringent vetting procedures. This was arranged so that the meeting would not be subject to disruption. Within the space of a few hours of this information being distributed, however, it was also made public: the TBC would be meeting at 4pm at Eddie’s bar in Cheltenham. Not long after this, and seemingly as the result of inquiries from journalists and concerned members of the public, the bar’s management decided to cancel the group’s booking, forcing them to hold the event elsewhere. That elsewhere was Unit 9, 158 Chesterville Road, Cheltenham, the site of something called the ‘Lads Society’. The ‘Lads Society’ announced its existence in October last year. The property was leased by UPF líder máximo Blair Cottrell’s sidekick, Thomas Sewell, who is joined by, among others, James Buckle — the President of gun lobby group ‘Firearm Owners United’. In promotional material for the new project, Tom indicated that among the reading materials the ‘Lads’ could enjoy perusing at the Society was Mein Kampf, the text Blair Cottrell notoriously declared that he wants issued to all Australian school children. See also : White nationalists True Blue Crew vow vigilante action in Melbourne, Rachel Eddie, The New Daily, January 14, 2018. While some media did attend the event, and police lurked, only one media organisation was granted ‘exclusive access’ to the meeting: Channel 7. First tonight, 7 News has been granted exclusive access inside a secret meeting organised by right-wing activists in response to Melbourne’s African youth crime crisis. Reporter Jodi Lee was invited into the True Blue Crew’s gathering and joins us live now. Good evening Jodi, what went on behind closed doors? Jodi Lee: Well good evening Jackie as we go to air tonight that meeting is still very much under way. 7 News was the only media organisation invited inside the meeting where more than 50 people, mostly men, gathered from all across the state. They came from as far as Cobram and Shepparton, Melton in the city’s west and Mornington along the peninsula. Now, they gathered at a meeting spot that belongs to the United Patriots Front but the men there hail from several different groups. They don’t say that they are right-wing activists, they call themselves patriots, and say they have come together to help average Australians deal with what they are calling an immigrant crime crisis. Now, they say they’ve been disappointed by the Andrews government and by Victoria Police who this group believes have been rendered unable to cope with rising crime. Take a listen to what their leaders tonight had to say. 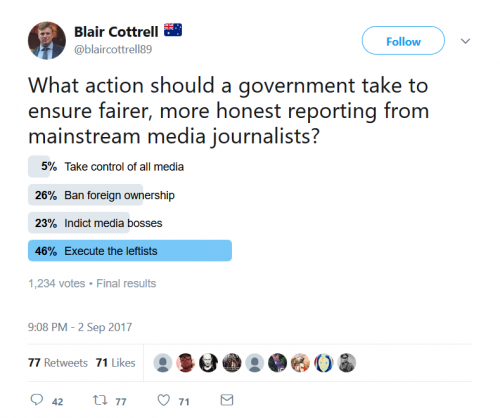 Blair Cottrell : Well nothing is being done. The government could be doing a lot more to combat this crime but police aren’t being given the powers they need to combat this problem we have in this country. Kane Miller : We have a few ideas we hope to put in place, it’s about time the community get involved because it’s clear to see that police can’t save us all. Daniel Andrews : People are free to meet and discuss whatever matters they want to. What I would say though is Victoria Police are best capable, best able and best equipped to fight crime and keep the community safe. 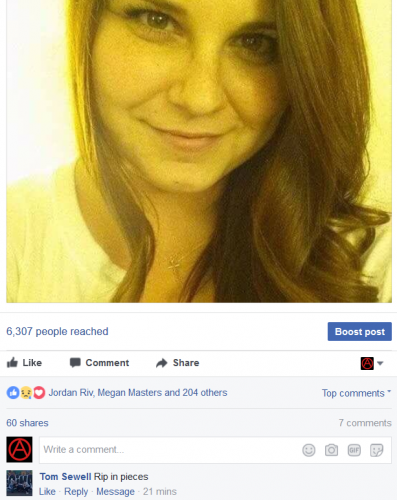 Jodi Lee : Now this group hopes to harness the power of social media to protect both them and their families. They’re hoping to create a kind of ‘Neighbourhood Watch’ that will be able to quickly let people know when an incident, a robbery or an attack in fact, is occurring and hopefully help send locals there to help protect residents, Jackie. Not unexpectedly, Channel 7’s promotion of the TBC African-hunting project, as well as its decision to put to air the views of a leading Melbourne neo-Nazi and his mate, has come in for some criticism. See : Oh Look, 7 News Gave The Spotlight To An Actual Neo-Nazi, James Hennessy, Pedestrian, January 15, 2018 /// Congratulations Australia, We’ve Successfully Normalised Neo-Nazis, Osman Faruqi, Junkee, January 15, 2018 /// Channel Seven ‘crossed a line’ with neo-Nazi interview, Broede Carmody, The Age, January 15, 2018 /// Channel Seven under fire over interview with far-right activist, Melissa Davey, The Guardian, January 15, 2018 /// No Channel Seven, Cottrell is no ‘right wing activist’. He’s dangerous, John Birmingham, Brisbane Times, January 16, 2018.
Who are the True Blue Crew? As noted above, the TBC are a Melton and Bendigo-based street gang that emerged in late 2015 and early 2016. It’s one of numerous flag-waving groups that have appeared during the course of the last decade, from the ‘Southern Cross Soldiers’ to the ‘Australian Defence League’. Since its inception, the Crew, under the leadership of Kane Miller, has organised a number of events. Its first rally took place in May 2016 in Coburg. Titled ‘Stop the Far Left!’, the rally intended to disrupt an anti-racist rally organised by the Socialist Alliance, to express opposition to the ‘Islamisation’ of Coburg and support for the concentration camps on Manus and Nauru (see : Coburg 1 /// Fascists 0; Or: The neo-Nazi rally that brought anti-fascists to the streets of Coburg, May 31, 2016 /// More reflections on ‘solidarity’ after the Coburg protest, January 7, 2017). As on future occasions, the TBC were joined on this occasion by (the remnants of) the UPF and a small clutch of (other) neo-Nazis wearing Wolk’s Hook regalia (note that members of this grouping later went on to form ‘Antipodean Resistance’). Having successfully waved flags in the city, the next TBC event was a ‘Rally Against the Rise of Islam in Melton’ in August 2016. This was another bizarre set-piece, this time pitting the TBC methgoblins up against the ‘Soldiers of Odin’ and its leader, Jason Moore (formerly a member of the ‘Patriots Defence League of Australia’). Undeterred by such shenanigans, the criminal prosecution of several of its members for assault (both upon anti-racists and their own — female — partners), common sense or basic decency, as well as appearing at several other events, the TBC returned in 2017 with another flag parade (June 2017) and have now embarked upon the formation — along with their neo-Nazi comrades in the UPF — of a lynch-mob to target African yoof. Or, as Jodi Lee put it, ‘a kind of Neighbourhood Watch’. Cottrell, 26, was sentenced to four months in prison in May 2012 after being convicted of 13 charges, including seven counts of intentionally damaging property. County Court Judge Michael Tinney convicted the then-22-year-old of throwing a missile, stalking, failing to comply with a community-based order, and two counts of recklessly causing serious injury. In December 2013 he was fined $1000 and sentenced to seven days in jail by a County Court judge for aggravated burglary, property damage, arson, trafficking testosterone, possessing a controlled weapon and breaching court orders. Last September, Cottrell — along with former UPF comrades Neil Erikson and Chris Shortis — was also convicted of serious religious vilification and received a small fine (and is appealing his conviction). Finally, Neil Erikson — who definitely did not attend the meeting on Sunday, as that would mean he was in violation of court orders not to associate with fascists — was in court again on Monday, facing a charge of contempt-of-court. See : A Dumbass Convicted Racist Almost Accidentally Swore On The Koran In Court, Cam Tyeson, Pedestrian, January 16, 2018 /// Anti-Islam activist Neil Erikson admits he breached court orders, The Guardian (AAP), January 15, 2018 /// Anti-Islam activist mistakes Koran for Bible in court appearance, Adam Cooper, The Age, January 15, 2018. Note that Erikson was accompanied to court by several other ostensible members of ‘Patriot Blue’: Lachlan/Logan Spalding (also present when PB racially-abused Labor MP Sam Dastyari), Julian de Ross (who also attended the TBC meeting on Sunday) and George Jameson and Penny Louise, recently expelled from Nick Folkes’ micro-Party For Freedom in Sydney. Joining Julian was also Daniel Jones, previously employed as a bodyguard to Avi Yemini, but otherwise — like a number of the budding vigilantes — working in the security industry. This entry was posted in !nataS, Anti-fascism, History, Media, State / Politics, Television, That's Capitalism!, War on Terror and tagged #7SummerOfNazis, Avi Yemini, Blair Cottrell, Charlottesville, Chris Shortis, Daniel Jones, Danny Nalliah, Firearm Owners United, George Jameson, Heather Heyer, James Buckle, Jay B Moore, Jodi Lee, Julian de Ross, Kane Miller, Lachlan Spalding, Lads Society, Logan Spalding, Mein Kampf, Neil Erikson, Patriot Blue, Penny Louise, Phill Galea, Rise Up Australia Party, Soldiers Of Odin, Stuart Von Muger, Thomas Sewell, Tom Sewell, True Blue Crew, Unit 9/158 Chesterville Road, Unit 9/158 Chesterville Road Cheltenham, United Patriots Front. Bookmark the permalink. The Seven Network’s extraordinary attempt to mainstream Nazi views by giving an uncritical platform to convicted criminal Blair Cottrell, leader of the far-right group United Patriots Front, has prompted concerns about the undermining of national security as intelligence agencies deal with the growing threat of neo-Nazi violence. 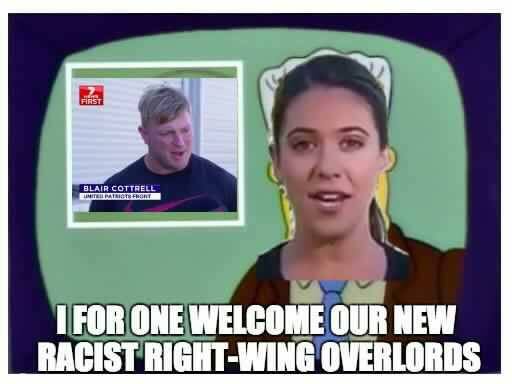 Seven’s “news” report on Sunday, in which Cottrell was allowed to freely opine about the alleged “African gangs” issue in Melbourne as a legitimate Neighbourhood Watch-style community group, prompted widespread condemnation and social media derision, with the hashtag #7summerofnazis trending heavily. 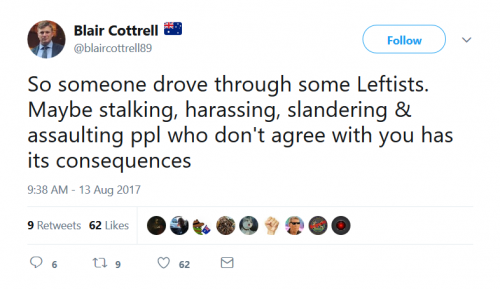 Cottrell, who also professes a range of misogynist and homophobic views, has been jailed for several violent offences including assault, damaging property and stalking, idolises Hitler and has proposed “execute the leftists” as a way to control media coverage. A member of UPF was separately charged in 2016 with preparing for a terrorist attack against left-wing groups. Lewis’ remarks were directed at another neo-Nazi group, Reclaim Australia. But it is understood that UPF is on the radar [of] police and intelligence agencies. Byrne’s fear is that the actions of Seven lend legitimacy to extremist views, creating a more accepting environment both for both groups disposed to violence and those who exacerbate community tensions, reducing the capacity of security agencies to gain the cooperation of communities to identify extremists. The price of mainstreaming Nazism and giving a platform to extremist criminals for ratings may yet be paid in a more dangerous currency.